Two people – one a man, the other a boy – stand, glaring at the camera. In front of them is a bizarre structure, which appears to consist of two large stones lying one on top of the other, both covered in patterns daubed in white paint. The bottom stone has a confusing collection of designs, including concentric circles and wavy lines. The top stone has two lines running down its side and written in clear capital letters the words DONT DISTURB. This is one of my favourite archaeological photographs, held in the National Monuments Record of Scotland. It shows one of a group of Bronze Age cist burials discovered in the 1930s during gravel quarrying on the edge of the village of Ferniegair, near Hamilton, in Lanarkshire. It was taken by J Harrison Maxwell who was an active field archaeologist at the time. 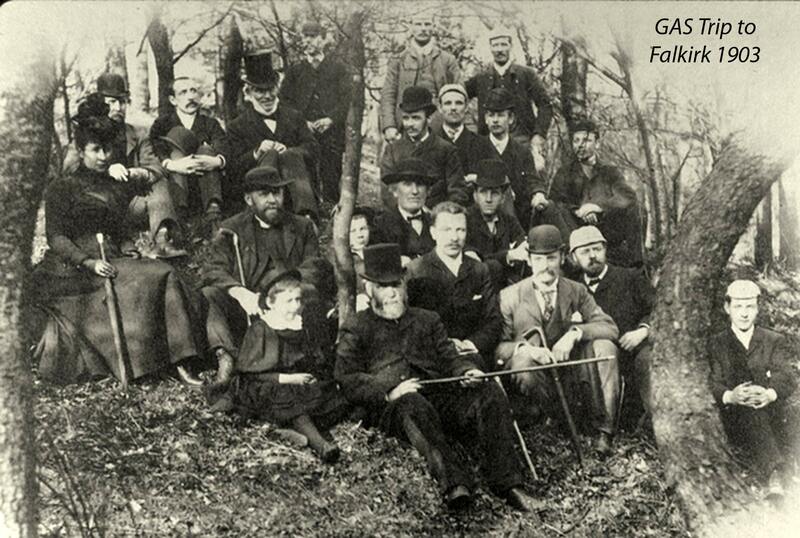 The two males standing beside the cist do not conform to the kind of people we usually expect to see standing beside archaeological sites from this era – usually, we expect men in suits and beards, perhaps the occasional lady, like the photograph below which shows the Glasgow Archaeological Society visiting Falkirk (or at least a clump of trees in the Falkirk vicinity) in 1903. 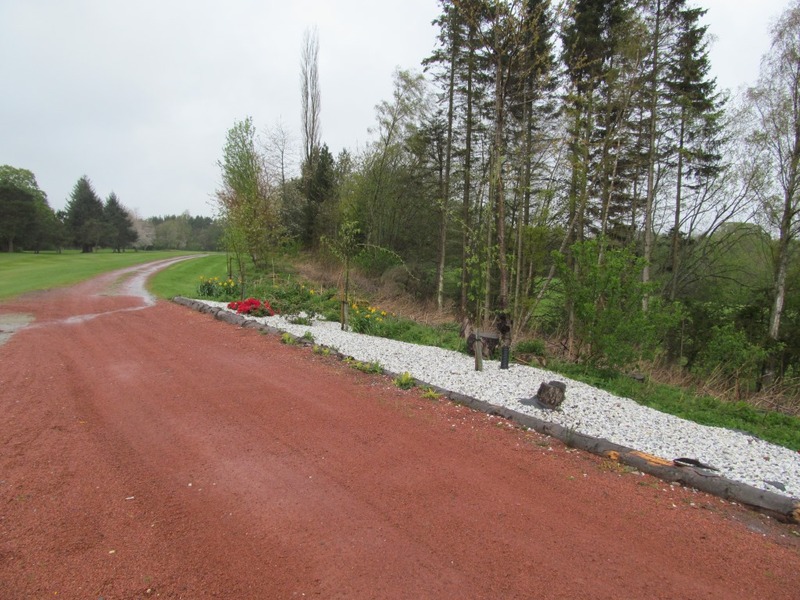 This blog is about the story of this prehistoric cemetery, but also about two small villages – Ferniegair and Allanton – undergoing a radical transformation because of the recent opening of a railway line. It is about events that have disturbed people and the past. 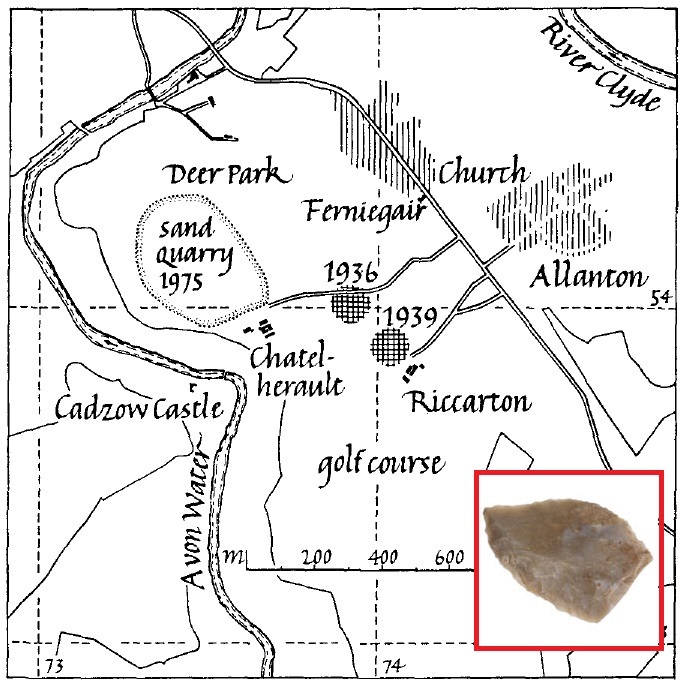 The story starts with the discovery of a cist at the start of April 1936 during sand quarrying operations in the grounds of Chatelherault, the Duke of Hamilton’s follyesque hunting lodge to the south of Hamilton. The quarry was called the Deer Park Sand Quarry and it was run by Messrs. David Hastie & Sons. The cist was a stone-lined box of large sandstone slabs, forming a coffin that containing the crouched inhumation burial of a young woman, buried with a piece of worked, and unworked, flint (the former is illustrated above). At this stage the legendary Ludovic Maclellan Mann stepped in to either conduct excavations, or monitor quarrying activity. As was his style, Mann disseminated his results via the Hamilton Advertiser, Scotsman and Glasgow Herald newspapers; for instance, the discovery was initially recorded in the Hamilton Advertiser newspaper of 18th April 1836. Mann also gave public lectures on the discovery, including to the Glasgow Archaeological Society. Subsequent accounts of the excavations were written by Alfred Miller (1947) and Humphrey Welfare (1977), both pieced together from newspaper articles, and in some places contradictory; nonetheless these are in invaluable source of information. (There is a good deal of confusion in the Miller account, conflating the 1936 and 1939 discoveries, and confusing cist contents.) For more on this site, it is NMRS number NS75SW 7. The initial cist discovery was only the beginning. 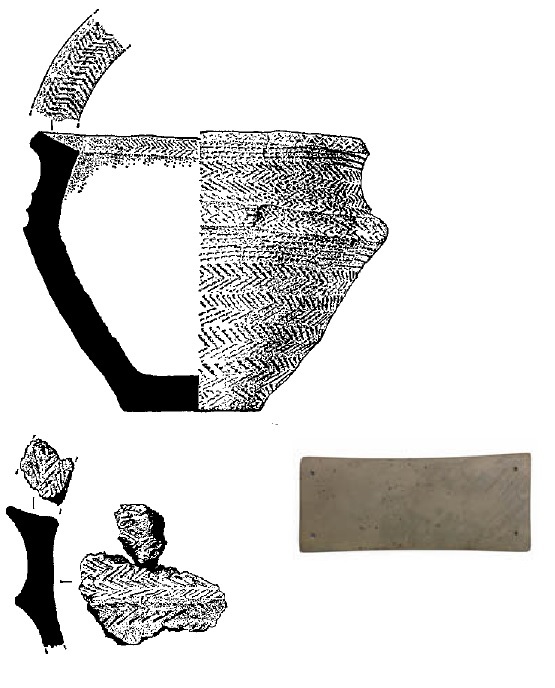 Two cinerary urns were found on 7th April, one of which contained a cremation burial and an archer’s wrist-guard (illustrated below); this was followed by the discovery of another cist on 14th April which contained a more or less complete skeleton and a Food Vessel (a Bronze Age pottery vessel style). Remarkably, the skeleton in this cist was ‘wrapped in or covered by a length of fabric woven from moss’ according to an piece in the Scotsman newspaper of 20th July 1936. Two further cremations were found by 21st April, one associated with an urn, the other with a beaker, and one unprovenanced Food Vessel. The strangest find from 1936 was according to Welfare a ‘clay mould allegedly for casting ingots in the shape of an astragalus’. The astragalus is a bone found in the foot, and has a roughly square appearance; in prehistory these bones may have been used as gaming piece or been involved in rituals. Mann lectured to the Glasgow Archaeological Society about this find, but Welfare suspects it was certainly modern (it had fluff attached), and perhaps a hoax. Further remarkable discoveries were made on 25th September 1939 in a nearby sand quarry owned by Messrs. Shanks and McEwan Ltd. Welfare records: ‘three graves, two cists and a simple inhumation, were unearthed at a depth of about 1.2m to 1.5m, close to the first tee of Hamilton Golf Course and roughly 100m SE of the previous finds’. This discovery was featured in the Glasgow Evening News on 27th September 1939. Our understanding of these burials is rather confused, based solely on contradictory accounts of the discovery by journalists for various different newspapers. The most remarkable discovery here was Cist 4, a massive sandstone stone box which contained the inhumation burial of a ‘delicately built’ adult. 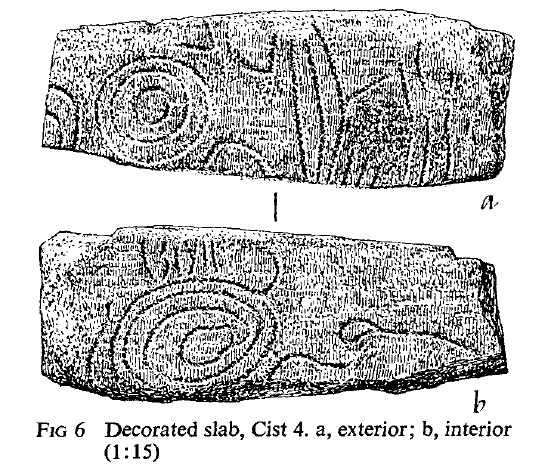 This cist included one slab which had very unusual and striking motifs carved on both sides (illustrated below). Welfare notes that Mann’s attempts to highlight the rock-art with white paint – shown in the photo that inspired this blog – were rather inaccurate and fanciful, given that he has marked two slabs with white paint. Of course the aforementioned DONT DISTURB graffiti is not authentically Bronze Age either and we have no way of knowing if Mann or someone else added this to the capstone. This wonderful selection of materials and structures seems to represent the remains of an early Bronze Age cemetery, in use for many centuries, with various different material culture sets and corpse treatments evident, reflecting changes in fashions and traditions over many generations. And this would have been a nice place to be buried: as Miller noted, this is a ‘beautifully selected burial place overlooking [rivers] Avon and Clyde’. Recently, I went on a short fieldtrip to visit the location of this cemetery today, followed by a visit to the local museum to see a reconstruction of Cist 4. The cemetery was found in two separate locations, both of which were quarries a few decades ago, but have since been dramatically landscaped; nothing remains to suggest either place was once a long-lived and sacred burial site. 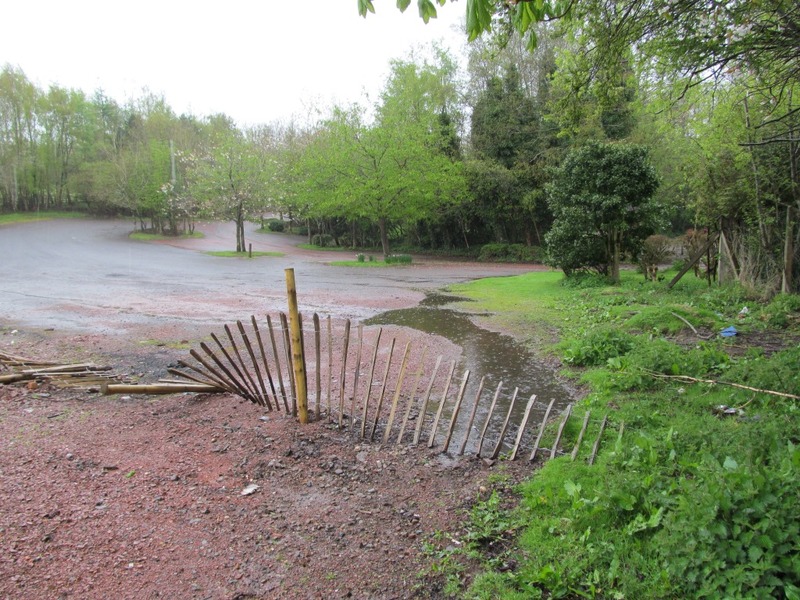 The 1936 discoveries were made in a location that is now an elaborate and rambling car park, amidst trees, although as the photo above shows, there are still hints that this place was once a quarry in the form of large pits (one now a pond) and large boulders lying around. The car park itself is unremarkable, and sits beside the location of what was once a garden centre: a large flat ash-covered space is all that remains of a once magnificent palace of plants, gift items and tea and cake consumption. This is a place that is full of ghosts, but they have been forgotten, bulldozed, erased and removed. Urban furniture abounds: sign posts, CCTV cameras, bins, ruinous wooden things all litter the car park, but there has also been creativity in the form of wood carvings, timber monuments and perhaps most fitting of all, wooden benches which act as memorials for people who enjoyed coming to this place. Sadly no memorial marks the place where 4000 years ago a young woman was laid to rest here with two pieces of flint. Still less remains to be seen at the location of the 1939 discoveries, beside the 1st tee of a golf course. Hamilton Golf Club moved to this location in 1925 and, according to the Club’s own website, the ‘course is now a tree-lined well bunkered undulating parkland layout’. Golf courses have a habit of landscaping the hell out of landscapes, terraforming hazards and strategically planting trees. This course is no exception, although the unusually high number of bunkers may be a subconscious nod to the sand quarrying that once took place on the fringes of the course. I immediately felt out of place when I arrived at the golf club car park, being careful not to park in someone’s place. 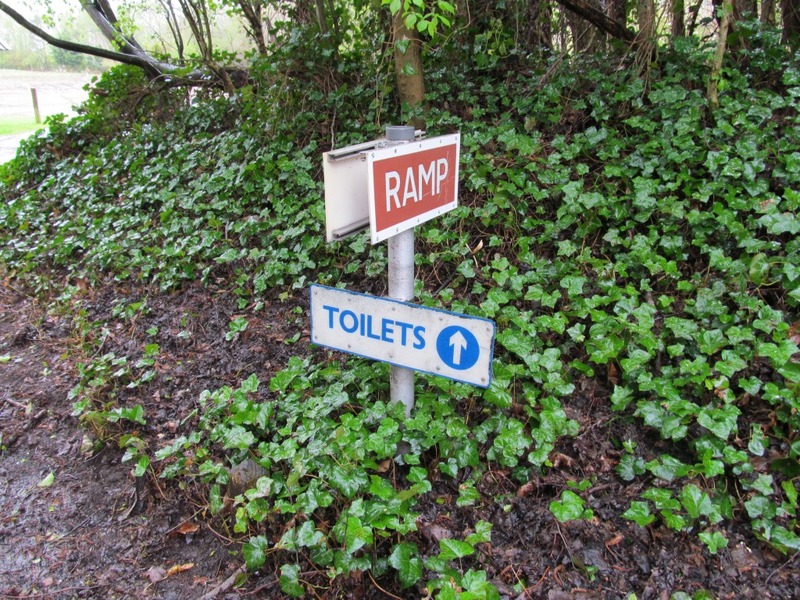 Urban prehistory can get you some funny looks, and I certainly felt observed as I wandered round to the 1st tee to witness a disappointingly banal ash path beside a steep slope – no sense at all exists that this was ever a quarry, never mind a cemetery. 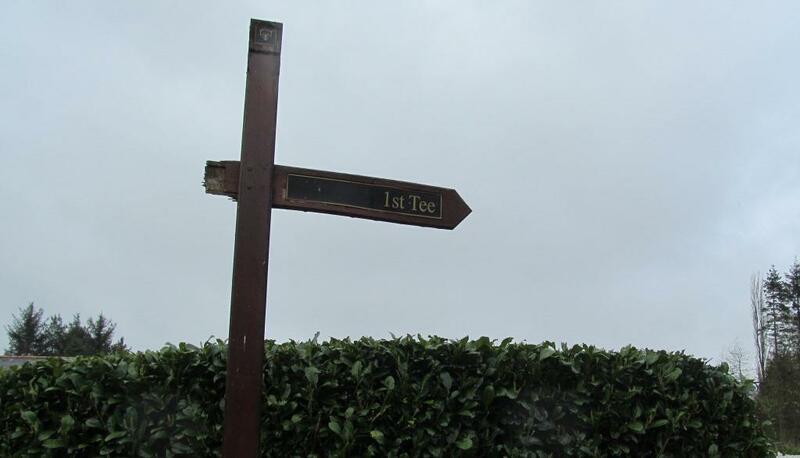 Sadly, this history of the Golf Club does not mention the poignant discoveries made just metres from where people with spiked shoes and dubious dress sense stand to thrash a small white ball into the near distance, although Hamilton’s industrial past is acknowledged. The display was upstairs, not downstairs as I remember it, but still has a visual and memorable impact. It dominates a room entitled (with a commendable breadth of scope) ‘Hunters, Farmers, Soldiers and Kings’. 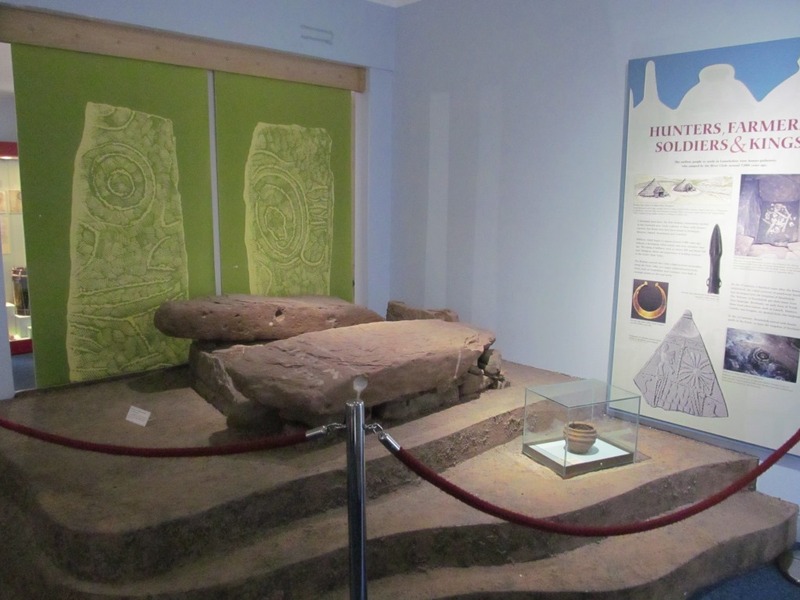 The cist sits behind a flimsy barrier, beside a glass box containing one of the Food Vessels. 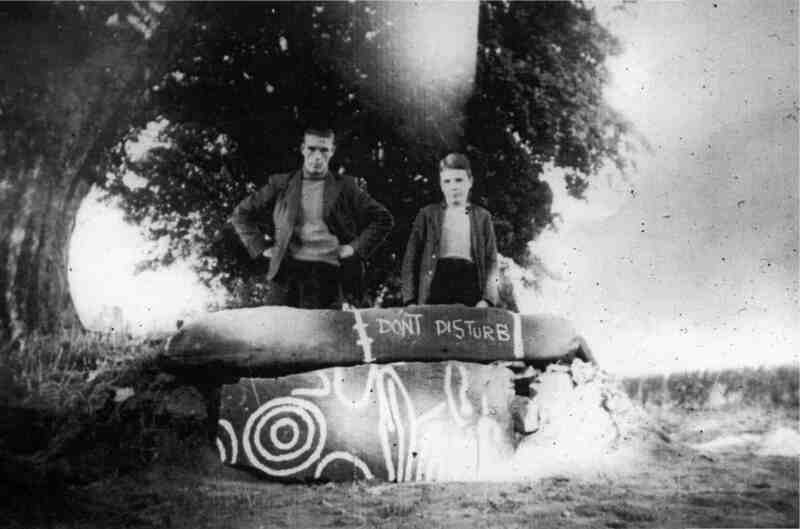 The stone coffin is reconstructed as it was found, and there is a sense of a flat-pack construction, with instructions such as ‘S under W cover’ actually daubed on the stones. Some of Mann’s white doodlings are still visible, and inside the cist, beneath a glass cover, lies a crouching skeleton, head off to one side, and a pottery vessel. To be honest I am not sure how much of this whole tableau is real, and how much is a modern copy, but the whole thing is effective and affecting. But one thing is for sure – this once buried person has been well and truly disturbed. When planning my fieldtrip, I noticed that a very recent discovery had been made in a field adjacent to Allanton, a strange village of wooden houses adjoining Ferniegair. The discovery (NMRS number NS75SW 358) was made in December 2012, when GUARD Archaeology Ltd. carried out an evaluation in advance of house construction. 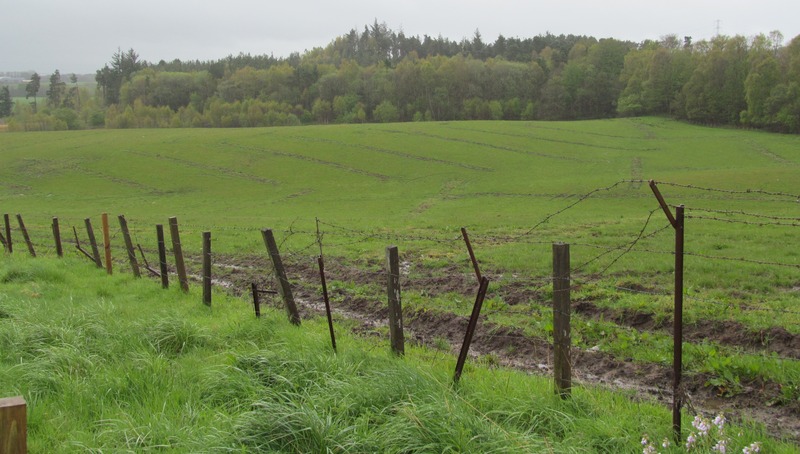 The evaluation trenches were still visible in the field when I visited, and the main reason this field was given so much commercial archaeological attention was because of the nearby Ferniegair cists. The discoveries were unremarkable: a small posthole and pit (not deemed to be ‘archaeologically significant’ by GUARD, whatever that means), and some topsoil finds. But they do hint at a radical transformation of this place in the next few years. 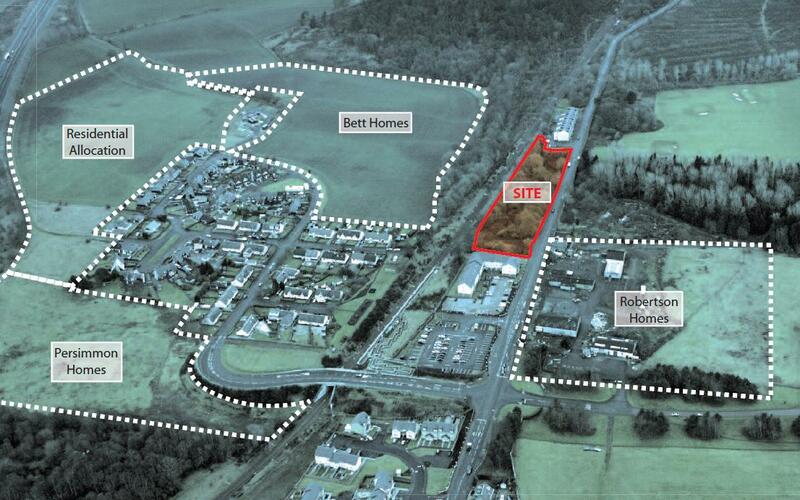 Plans are afoot to triple the size of Allanton / Ferniegair with a series of major housing developments proposed, in no small part driven by the relatively new railway station (Chatelherault) opened here in 2005. The air photo below shows how the fields around these small villages have already been carved up and sold off to various developers, and give a sense of how this place is going to radically be disturbed in the coming years. As well as hundreds of new homes, the developments will also include play parks, a new primary school and the creation of ‘green spaces’ (an interesting concept given that currently these plots are all fields). Some objectors to the plans felt that the development was out of keeping with the character of the villages. This is the problem with big developments like this: do we accept progress and change, or do we put up a DONT DISTURB sign? And when the ground is broken, again and again, what will archaeologists find? We have to finish back at the enigmatic photograph that inspired this post. Who are the two bystanders, and who is the photographer? It seems unlikely that this is an illicit photo, although it is noticeable that a more formal photo within the NMRS shows a group of suited and hatted men standing in the same place – but at that stage, the mysterious two word statement had not been added. Were these the finders of the cist, or the finder and his son? Were they David Hastie and Son? Was this a photo taken for one of several newspaper articles about the discovery? And what of the graffitti? The words DONT DISTURB could mean many things – a plea to respect the privacy of the dead perhaps, or written by Ludovic Mann to stop workmen or locals from meddling with the archaeological site or his crazy paint job. Or maybe this a the message from the quarrymen who were fed up with their work being delayed and fed up finding graves and bones and wanted to be left alone to get on with their lives. Yet the irony is that quarrymen and archaeologists make their living by disturbing things: digging into the earth, removing things, causing a disturbance, waking the dead. And we may not have seen the last of that kind of thing in Ferniegair. 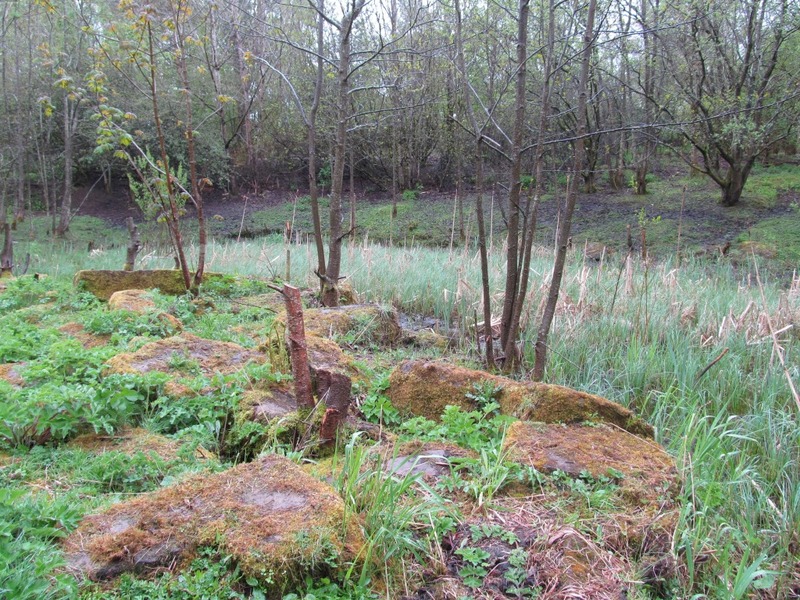 Sources: Information about the cist discoveries at Ferniegair came from two sources. 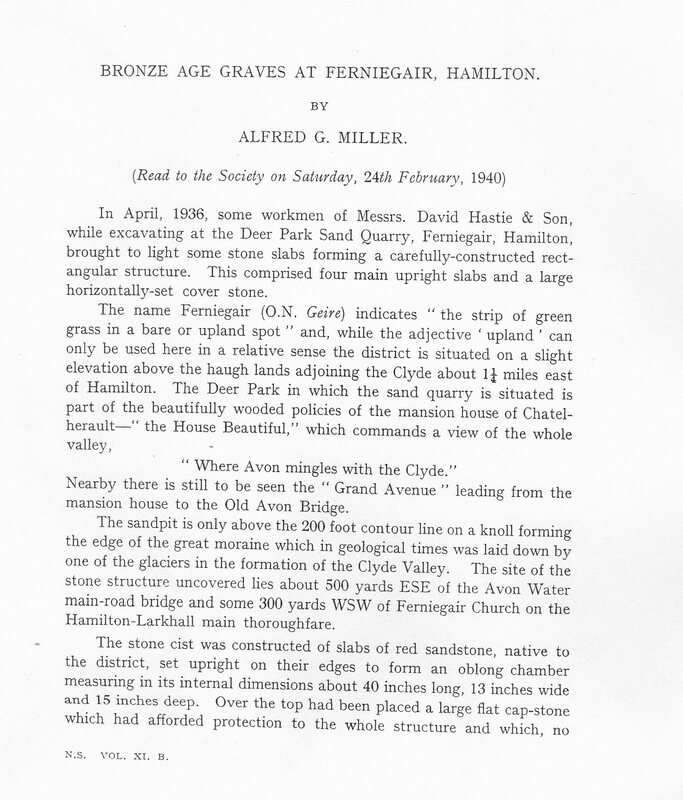 The earliest is an article by Alfred G Miller, entitled Bronze Age Graves at Ferniegair, Hamilton. This was published in the Transactions of the Glasgow Archaeological Society volume 11, pages 17-21 (published in 1947). A more coherent narrative is offered by Humphrey Welfare in an article entitled A Bronze-Age cemetery at Ferniegair, Lanarkshire, published in the Proceedings of the Society of Antiquaries of Scotland volume 106, pages 1-14 (published in 1977). This latter paper was also the source of several of the illustrations above, including the location map, small finds and rock-art cist slab. The photo that inspired this blog is available online via the NMRS and was taken by J Harrison Maxwell. 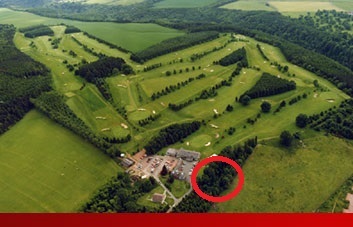 Two air photos were used in this blog – one was found on the Hamilton Golf Club website, and amended by me, while the other appears in various estate agent type websites. The photo of the Glasgow Archaeological Society trip to Falkirk was sourced from the GAS website, while the images of the flint, and archer’s wrist-guard, both appear on the Glasgow Museums Collections webpage. The Astragalus picture is available widely online.